Instead of our usual cold weather Chicago or DC Dinners, this year my Grandmother is hosting Thanksgiving down in Delray Beach, Florida! With it's bright colors and vintage architecture,Delray is one of my favorite beach towns and a constant source of inspiration for Nona E Rose. We're staying at one of my favorite hotels The Colony. Follow along on Instagram and look our for a Travel Guide coming soon! 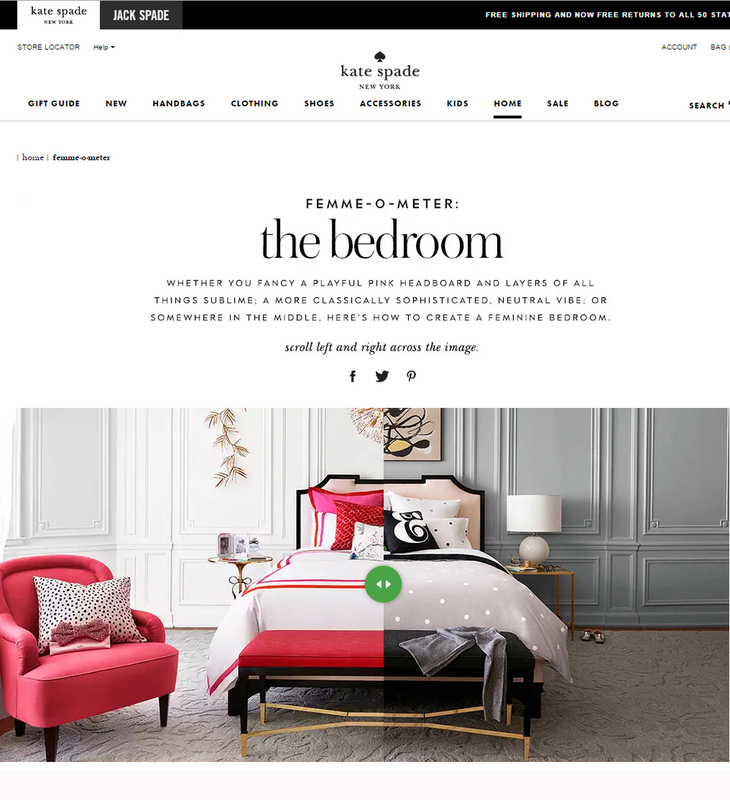 Kate Spade, know widely for it's ultra-girly-Audrey Hepburn-like whimsy recently expanded their home offerings with a collection of furniture to complement their well established bedding and tabletop collections. While I could have predicted the pops of pink, I was pleasantly surprised by the sophisticated greys and relaxed novelty of half of the collection. My favorite part of this new venture however, was the digital presentation on their website. The "femme-o-meter" allows the user to look at the same room different ways depending on how "femme" they are looking to go when it comes to decor. The scroll button in the middle of the picture is a simple and clean call to action, immediately drawing the user to look at the same room in different ways. This not only shows creative UX design, It shows that Kate Spade is growing up with it's customer. The 22-year-old that goes full-on girly decorating her first apartment, may upgrade a few years later for something more modern and neutral. Merchandise wise; It's the perfect way to keep a loyal customer happy and in terms of digital, it's an incredible way to communicate multiple product stories on one screen. During New York Fashion Week, I had the privilege of partnering with BSmart Guides to profile 3 Designers, Georgine, Leanne Marshall, and Haney NYC. Bsmart Editor, Megan Hooper and I put together designer profiles and Watercolor Illustrations for all 3 shows. It was my first experience Illustrating for live shows - both exhilarating and terrifying but I am so happy with the final product! Check out the full feature on their website!